Grilled Rosemary Chicken | Om nom nom! This is another recipe from the great magazine cleanup of 2013, and we liked it a lot…would definitely make it again. It came from Bon Apetit in 2011. I used a whole chicken already cut up, marinated overnight as the recipe suggested, and it was awesome. The only difficult part was grilling the breasts – they were *huge* and thus difficult to cook all the way through. I might do only thighs next time. 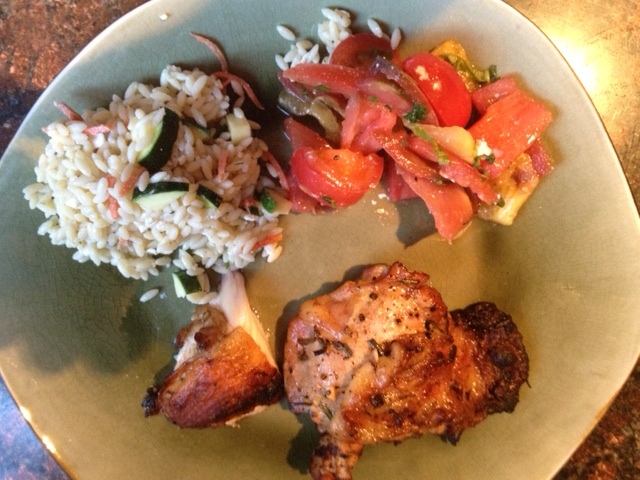 We had this with an orzo/feta pilaf and an heirloom tomato salad. Great summer meal. Heat a grill to medium-high. Let chicken come to room temperature. Brush off marinade; grill chicken, turning occasionally, until browned and almost cooked through, about 20-22 minutes for legs and thighs, 16–18 minutes for breasts. Pour remaining 1/4 cup oil into a small bowl. Dip 2 rosemary sprigs in oil; occasionally baste chicken with sprigs until cooked through, about 5 more minutes. Let chicken rest for 15 minutes. Transfer to a bowl. Cut lemon in half lengthwise, then cut thinly crosswise into half-moons. Add to chicken with any leftover basting oil; toss to coat.